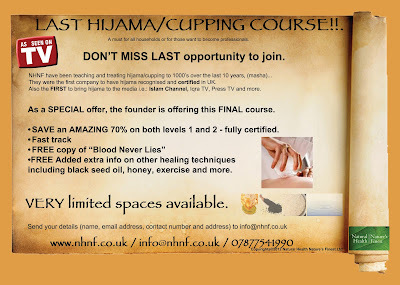 Natural Health Nature’s Finest has been the first in UK to offer certified Hijama courses for more than 10 years. 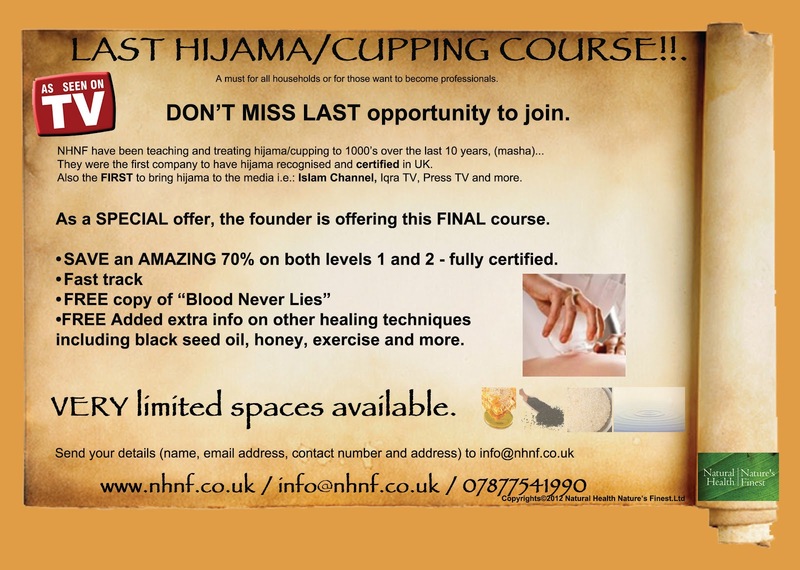 With great honour we would like to announce in September 2012 we will be offering our LAST Hijama course for a limited amount of people at a special price of £750 for both levels. Both courses will run for 5 months (3rd September 2012 – 18th February 2013) and the registration is open from 2nd July 2012 till 20th August. · We have reach the maximum amount of registration. · Past the due date. · Deposit not be made when the form is send. This is a distant learning course therefore you are not required to attend any classes however you will be called to attend a ONE DAY practical lesson in your nearby cities in OCTOBER 2012. Once you pass you will receive CMA certificates for both levels. Our offer not only benefits those who would like to open their own clinic in UK or other country but also for personal purpose.